See more objects with the tag architects, architecture, home, model, revival, buildings, iron. This is a Birdhouse model. It is dated ca. 1868 and we acquired it in 2013. Its medium is cast iron model on wood base. It is a part of the Product Design and Decorative Arts department. This birdhouse model would be a modern addition to the museum’s collection of birdcages and models. It serves as both a model of the Gothic-style cottage, Clifton, in Roslyn, New York, and as a functional object. 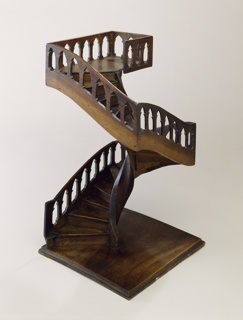 The model is typical of a sample a cast iron factory would have made to show off the quality of their work while satisfying the mid-19th-century interest in models. The use of cast iron, a material not normally associated with cottages, promoted the idea that an object could appear historic while utilizing new technology. It also is an example of the application of new technology in a collectible object. 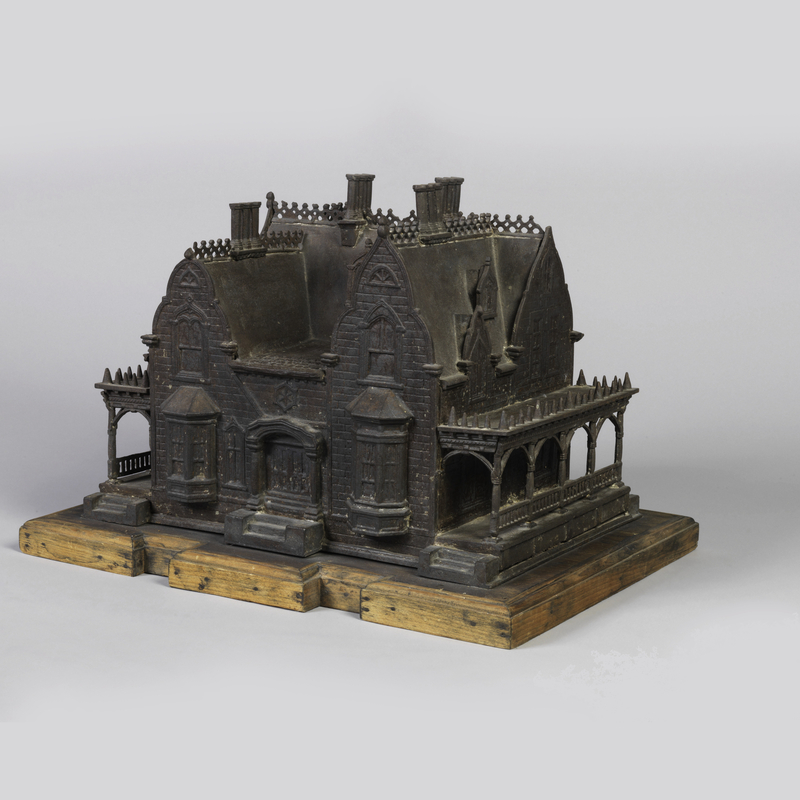 The birdhouse’s design is very similar to some of the designs published by architect Alexander Jackson Davis and landscape designer J. C. Loudon, reflecting the popularity of Gothic as a domestic building style in mid-19th-century America. This model is one of a group of models proposed for acquisition. Models are an important part of the design process and demonstrate craftsmanship, skill of execution, and the innovative use of materials. The group under consideration would provide the museum with an opportunity to examine the role of the model in many contexts. Stamped: "Miller Iron Co. PROV. RI PAT. D Apr 14 1868"